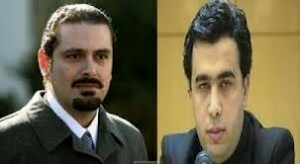 Al Hayat newspaper reported that the Syrian regime authorities issued arrest warrants against former Lebanese PM Saad Hariri, Future Movement MP Okab Sakr and Media Coordinator for Free Syrian Army Luay al-Miqdad . Syria sent the arrest warrants to the following countries: Saudi Arabia , UAE, Tunisia, Algeria, Muscat , Iraq ,Kuwait Soudan and Qatar but did not send to Libya, Yemen and Egypt or Lebanon . Excluding some Arab countries fueled debates. This development comes after the Baath Party in Lebanon accused Hariri of fueling the tensions and killings in Syria, and held him responsible for bloodshed in the crisis-hit neighboring country. sorry but no one recognises the Syrian regimes authorities anymore, so who cares. The Syrian regime assassinating twice Rafic Hariri by attacking his son Saad who is the son of the Martyr killed by that same regime.Its the famous Syrian regime equation of the killer becomes the victim, the Syrian regime killing machine backed by the biggest conspiracy on the planet against the Syrian free people and neighboring Lebanon. All the countries have blood now on their hands because they are watching the conflict like spectators, not even real actors…. Where is the UN, the USA, Europe… where are everybody, shame on you!!!! The syrian people has right to live in respect and dignity, let them rule their own country and judge the head Bachar Assad and its members once for all. This regime is based on corruption and injustice, and should be dissolved because its a danger for the good sake of humanity. A desperate attempt to secure the illusion of legitimacy. The Syrian regime is at its last breath and starting to accuse whoever possible for its own demise. Arrest warrants against non-Syrians are nothing more than empty words and ink on paper. I would like to see a Lebanese government reject these arrest warrants. Or should we issue arrest warrants against Bashar El-Assad for all what he and his family did to Lebanon and the Lebanese ? The criminals are issuing arrest warrants against the innocent, this is typical hamasni ! Doesn’t everything ‘fuel’ debates’?? Maybe that’s why the gas isn’t making electricity? ?